The Surgeon Generals Report on Physical Activity and Health Report suggests that all individuals burn 150 calories of energy per day in order to maintain a healthy body composition of bone, muscle and fatty tissue. (1) The maintenance of a healthy weight requires that the energy you consume in calories must equal the amount of energy you burn. Energy is another word for “calories.” What you eat and drink is energy IN. What you burn through physical activity is energy OUT. This “energy balance” is off for many children today. 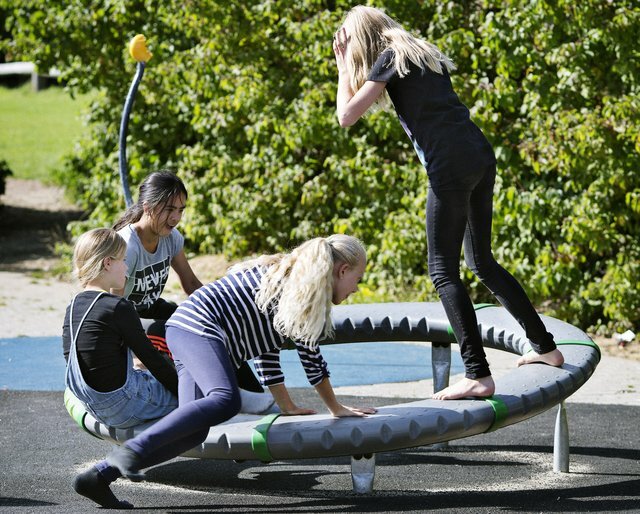 A recent research study of physical activity in playgrounds found that “just play” contributes significantly to daily energy expenditure in children. In just 45 minutes of play, school aged kids on playground equipment, reach the goal. Half an hour of play, in combination with physical education (PE) and after school sports, is more than adequate for a healthy level of physical activity. A recent research study sponsored by KOMPAN, Inc. involved two schools with children from first, second and third grades. They engaged in half an hour of free play on playground equipment. The calories expended in contracting muscles in the process of producing physical movement was measured by the Bio Trainer II Calorie Counter and results calculated based on each child’s body weight. The playground equipment consisted of school age playground equipment: Galaxy Electra, Supernova, Vega, Spica and Edge Glacier. The Galaxy Electra and Edge Glacier are both larger structures intended for lots of children and the Supernova, Vega and Spica are smaller individual pieces intended for one child or small group play. 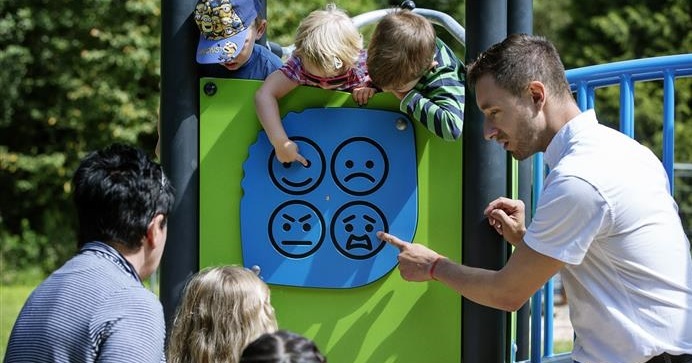 KOMPAN wishes to thank Red Cliff Elementary in Utah and Tora’s Emes Academy in Florida for lending their teachers’, principals’, playgrounds’ and children’s time to participate in this study. Without the cooperation from the principals and recess coordinators, conducting this study would not have been possible. School aged children burn a significant amount of calories through physical play on Kompan playground equipment. The increased amount of calories burned for third grade children indicate a high level of play activity and that the equipment holds children’s interest over time. As a child’s skill level and physical dexterity increases, more calories are burned. Playgrounds with developmentally appropriate equipment contribute to children’s physical activity counts. The total amount of 150 calories can easily be accomplished with just 45 minutes of play per day. Playground play, in combination with sports activities during recess, PE, or before and after school activities, is an optimal environmental intervention for children’s health.